Sand T of artSPACE@16 is grateful for have the opportunities to contribute to the consultation to establish Irving Street Studios in downtown Malden. artSPACE@16's voluntary involvement in this art collaborative included but not limited to: identified potential committee members for the City's venture in creating artists' live/work space in Malden, provide community outreach support, contributed input on the conversion of Sacred Heart Church convent to artists live/work building. Sand T continues her on-going self-initiative effort in providing community outreach support to this project by spreading the word about the development of this project on artSPACE@16's website, sister sites, art related list-services, media and word-of-mouth. February 8, 2008 - City/MRA receive $5K Grant to promote artists-in-residence project. As part of a City of Malden-sponsored initiative to cultivate relationships and partnerships with members of the local arts community, the Malden Redevelopment Authority has received a special permit to convert a former convent into live/work artists space. The MRA intends to purchase the convent at 30 Irving Street from Sacred Hearts Church. Funds from the sale will go to the local parish to support many of its needs including a roof replacement project at its Cheverus School. The proposal has generated an enthusiastic response from the local arts community, many of whom were on hand for the Planning Board public hearing testifying in support of the proposal. Under the plan, there will be four “for sale” residential condominium units in the building and upwards of seven work spaces for area artists. At least one of the residential units will be affordable. In addition to the convent renovation project, the MRA over the past year and one-half has opened two art studios in what were vacant ground floor retail space. One called Ideas5 is located at 183 Pleasant St.; while the other called SoHo Art Center operates at 15 Washington St.
For more information about the ongoing effort to promote the arts in Malden, persons may contact Deborah Burke, Project Director, Malden Redevelopment Authority, at 781-397-7000 or dburke@cityofmalden.org. October 20, 2005 - Malden For the Arts! 7-1! Hello Malden Supporters! This post is in regards to the voting result of the PUBLIC HEARING ON THE CONVERSION OF SACRED HEART CHURCH CONVENT TO ARTISTS LIVE/WORK BUILDING at City Hall last night 10/19. I'm thrilled to inform you that the vote was 7-1 in favor of the conversion. Thank you all for attending the hearing and sending in your letters of support. It's so encouraging to see such civic and governmental support for the arts in Malden. There will be more updates on this City's venture, please stay tuned. RE: A PETITION FOR A SPECIAL PERMIT UNDER 700.1.3 OF THE MALDEN ZONING ORDINANCE TO ALTER AND OCCUPY THE PREEXISTING NONCONFORMING BUILDING FOR DIFFERENT NONCONFORMING USES (FOUR-FAMILY RESIDENTIAL DWELLING, ARTIST WORK STUDIOS AND RELATED ACCESSORY RETAIL SALES AND SERVICES, GALLERY, CLASSROOM AND OFFICES) AT THE PROPERTY KNOWN AS AND NUMBERED 30 IRVING STREET, MALDEN, MA. My name is Sand T. I am the founder and director of artSPACE@16 gallery in Malden. I am writing to ask for your unreserved support for the petition to vary the dimensional controls under the zoning ordinance to allow the proposed new use for the Sacred Hearts Church. artSPACE@16 is not just a gallery presenting innovative contemporary art exhibitions, but a community activist entity. It has played a leadership role in art collaboratives and initiatives within the community since it's inception in 2000. It has pushed to shape an art community in Malden by inspiring and working with the City to create studio and gallery space. My collaborative relationship with the City goes back to my first visit to Mayor Howard’s Office in December 2002. During our meeting, Mayor Howard expressed the City’s commitment to the arts and in creating artist live/work space. In 2003, the Mayor’s Office, Malden Redevelopment Authority, The City Council's Downtown Committee, and I (artSPACE@16) co-organized a discussion called REVITALIZING MALDEN SQUARE THROUGH THE ARTS. This discussion was held on February 26th at the City’s conference room. It was designed to reach out to all artists to get their ideas on how they can be part of the revitalization process, creating artists live/work space and art related business opportunities in the Malden Square area. This discussion was attended by 45 local artists who expressed their enthusiasm towards working with the City. They were interested in low cost combined living and work space and organizing art events that would benefit Malden culturally and economically. Many that attended said that they would be willing to "give back" to the community by offering art classes from their studios and at the schools in particular. The creation of educational partnerships between artists and the local institutions will definitely enrich the art and cultural life of our community. The participation and continuation of the Malden artists’ community plays a significant role in revitalizing the City. There are ideas and plans to open art galleries, artist co-ops, organize window art projects and to hold an open studios tour to bring artistic and cultural traffic to downtown Malden. This shows of the optimism and confidence people have in the direction the City is taking. Malden’s commitment to constructing a solid foundation for serious artists to work upon will have only beneficial rewards for all of Malden’s residents. The establishment of these artist studio spaces will lead to beneficial revenue for the businesses of downtown Malden. It will also provide much needed exposure for the artists. In turn, our residents will have easily accessible opportunities to experience today's art created by local artists. This will result in a rewarding experience for all concerned. In 2003, I encouraged the creation of exhibition space within the Mayor's Office that could hold ongoing exhibitions featuring local artists. The City keyed up to this suggestion and I curated its premier exhibit entitled MALDEN ARTISTS - NEW WORKS featuring 17 Malden artists that Fall. Since then, “The Mayor’s Gallery” has been showing and promoting local visual artists through its gallery. In April/May 2004, I voluntarily conducted a survey of artists to consolidate their needs concerning live/work space. Through a questionnaire I composed, artists’ desires regarding studio size, leasing vs. ownership, financing, amenities, and community characteristics were determined. This report was shared with the relevant authorities at Malden City Hall for them to better understand artist’s space needs while pursuing the creation of artist’s studio space in Malden. The results of this survey revealed a significant demand for artists’ live/work space in Malden. The respondents are involved in a wide range of disciplines. The highest population of respondents work in a 2D medium such as painting and printmaking; sculpture was the second highest, followed by photography, mixed media work, and the performing arts. 50% of the respondents are Malden residents, the other 50% are artists from the greater Boston area. This data indicates that there are artists willing to relocate to Malden if provided with the right situation. Last of all, I want to take this opportunity to assure the Planning Board that the City’s venture of revitalizing downtown through the arts will be advanced to the next level with the conversion of the Convent. This conversion is a manifestation of a partnership between the grassroots entities in the artists’ community and the City. The continued growth of Malden’s artist community and this promising conversion is a guarantee of Malden moving toward a flourishing future. I therefore sincerely ask for your full support of this project, for it is a most creative way to build community and revitalize downtown Malden. A copy of the report on A SURVEY OF ARTISTS SPACE NEEDS IN MALDEN. 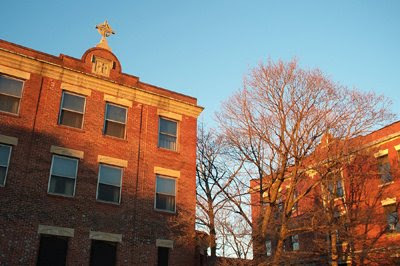 The Malden Redevelopment Authority will be appearing before the Malden Planning Board at its meeting on October 19th, 2005 to reuse the property, former Sacred Hearts Church convent located at 30 Irving Street as artist live/work space. Meeting is scheduled for 7 p.m. in the Council Chamber, 3rd floor, Malden Government Center at 200 Pleasant Street. The MRA is asking the Planning Board for approval to convert a prior non-conforming use into another conforming use and also asking their approval to subdivide the lot from the adjacent Cheverus School. September 15, 2005 - HELLO, MALDEN SUPPORTERS! PLEASE BE INFORMED THAT THE PUBLIC HEARING SCHEDULED ON SEPT 15, 2005, AT 6:30 P.M. BE HELD IN THE COUNCIL CHAMBER HAS BEEN CANCELLED! I will have new posting about the meeting re-issued by the City up soon on this page. Please check back in later. September 12, 2005 - A Call for MALDEN ARTISTS / RESIDENTS ONLY! Your Immediate Support Is Needed! Please respond and/or forward this CALL to your fellow Malden Artists / Residents. Thank you very much. affordable live/work space for artists. Malden Redevelopment Authority, asking to vary the application of Section 500.2.8.2, Chapter 12 of the Revised Ordinances of 1991, as amended, of the City of Malden in the following respect: Parking requirements for allowed residential use in central business district (multifamily residential dwelling/ up to three stories), as per plans, at the property known as and numbered 30 Irving Street, Malden, MA. Mr. Robert Donnelly, Chairman, Malden Board of Assessors, Room 317, Malden Government Center, 200 Pleasant St., Malden, MA 02148.